*The next time I make them I’m going to omit the chocolate chips because the ‘gum’ up the cookie when cutting and sometimes their flavor gets in the way of all the other little goodies. I’m also going to go with all craisins instead of a mix with raisins. The recipe reflects both these changes. Really the choice is yours as to what nuts, seeds, and fruits you’d like to put in these. As long as you total between 3 1/2 to 4 Cups of items, you’ll be good to go. Once blended, gradually stir in flour mixture until smooth. Divide the dough in two equal mounds and shape into 11 x 1.5 inch logs. 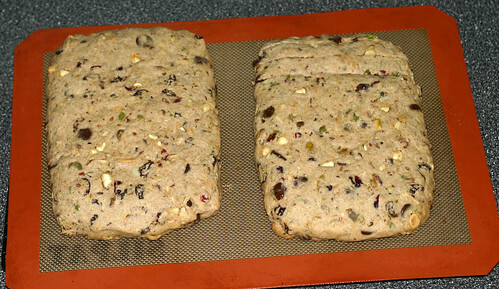 Arrange on a greased or silpat lined cookie sheet. Press logs to flatten slightly as photographed. Bake at 375° for 25 minutes, remove from oven to cooling rack. When cool enough to touch, carefully transfer to a cutting board and slice crosswise at a slight diagonal, into 1/4 inch slices. Lay the slices back on the cookie sheet and bake for minutes. Turn slices over and bake for another 5-10 minutes or until golden brown. Transfer biscotti to cooling racks to cool. Oooooh, these look soooo gooood!!! I LOVE Biscoti!!! Dear, oh dear! I don’t know if I can go through the day without one of those biscotti! I love all the nuts and citrus zest in it… I could see some semisweet chocolate in there too! I finely chop mine in the Cuisinart for biscotti, this way it doesn’t get gooey. You might want to try that instead of the white chocolate chips? Love this recipe!!! Oh Biscotti is a weakness for this coffee lovin’ dunker. Heck Mary I can almost taste them from here! Made biscotti just once. They turned out ok, nothing to rave about and for sure nothing like the beauties you turned out! Will have to give it another shot with your recipe. 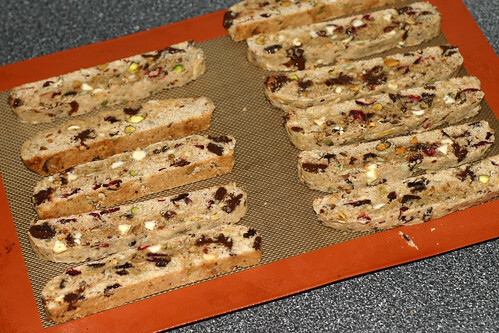 I made a similar biscotti a couple years ago – just with dried cranberries and pistachios because I like the red/green combo. Nothing better than a crisp biscotti with a hot cup of coffee! I make a ton of biscotti every year for Christmas presents. (Went thru about 50# of Guisto’s Baker’s Choice flour December). My research says that true Italian biscotti has no butter/oil/fat in it, that the moisture comes only from the eggs, but I’m not sure. People are always impressed by them, for some reason everyone thinks they are difficult to make. Yours are beautiful! 50# – that’s a LOT of cookies!!!! I was one of those folks who thought they were difficult to make. How I came up with that conclusion without ever looking at a recipe is beyond my understanding. They are a beauty to behold! Wow, these look great! Love all the fruit and nuts going through the dough. I’ve never tried making biscotti either! It’s going on my to do list. I’m making my first batch today and have 2 flavor profiles in mind. Hopefully, I’ll be as successful you and I’ll post them. Congrats on Top 9. 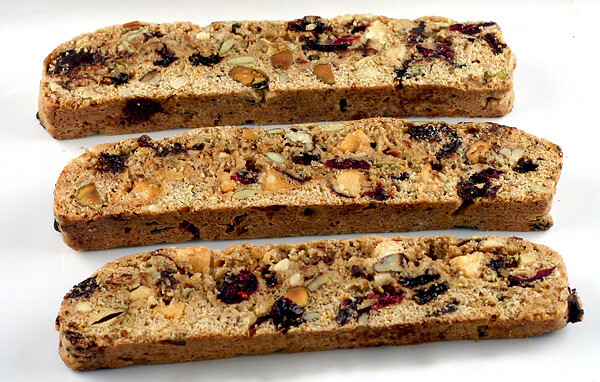 What great looking biscotti. You should share these over at http://www.dishfolio.com you would be a great addition.